"The Bambino" (or "The Sultan of Swat") is regarded by most as the greatest baseball player of all time and was one of the original five players first named to the Baseball Hall of Fame. The Babe was the first to hit 50 home runs in a season and his 60 home run season record stood for 34 years until Roger Maris broke it in 1961. Ruth was also one of the games best left handed pitchers until converting full time to the outfield in 1919 while still with the Boston Red Sox. 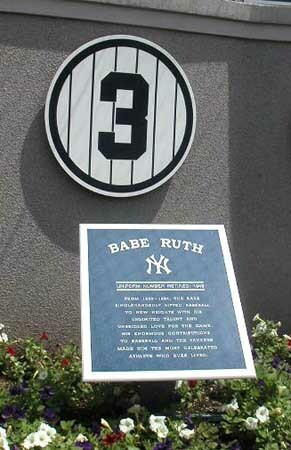 His number 3 has been retired and is immortalized in Yankee Stadium's Memorial Park.